The original five “Star Trek” figures were released in 1974, and included Capt. Kirk, Mr. Spock, Dr. McCoy (Bones), Mr. Scott (Scottie), and the Klingon. It is notable that these were the first 8″ Mego figures to be available exclusively on blister cards, having never been available in boxes throughout the entirety of their run. The initial card art featured profile paintings of all five characters, the “Star Trek” logo in white, and each figure’s name depicted in white text above the bubble. The package back also featured these same five profiles on a blue field. These cards were later amended to include Lt. Uhura. Her profile was added to the line-up, and the “Star Trek” logo was changed to a more colorful light blue. Additionally, the back was replaced with advertisements for the U.S.S. Enterprise Playset and Communicator walkie-talkies over a field of purple. A later amendment to the first series cards consisted of changing the text of the figure’s name from white to the color of the respective character’s profile circle. The first series was originally released on Type 1 bodies with several running changes in the facial paint schemes. These were soon transitioned to Type 2 bodies, where the manufacturing settled down to a more uniform process. As a rule-of-thumb, Type 1 bodies are found on “5-face” cards, while Type 2 bodies are found on “6-face” cards. There have been “transitional” specimens found which do not conform to this distribution pattern, but they are quite uncommon. All six figures were available individually through popular mail-order venues of the day (Sears, Montgomery Ward’s, etc.). These mail-order figures each came in a clear plastic bag, which in turn was shipped in a small, non-descript brown carton. Although not especially attractive or collectible, mailer boxes were far less prevalent than standard retail packaging, and, due in no small part to their underwhelming appearance, were most often discarded upon receipt. Assembling a set of these figures in catalog packaging can be a daunting task; luckily, few collectors care enough to accept the challenge. 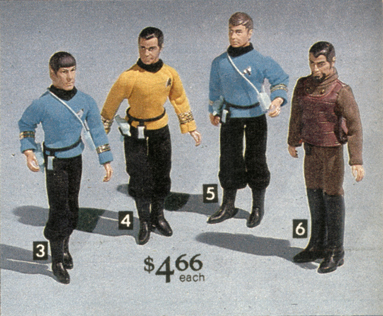 Additionally, the original five figures (sans Uhura) were included in an exceptionally-rare U.S.S. Enterprise Gift Set. These figures came individually-packaged in baggies identical to their catalog brethren. 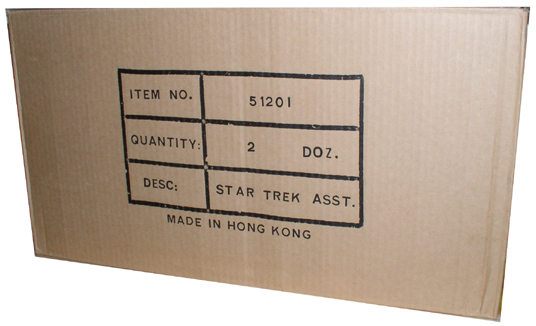 Type 1 figures were definitely included in the gift set; however, it cannot be confirmed whether the Enterprise saw a long-enough production lifespan which would have allowed the possibility of Type 2 inclusion. 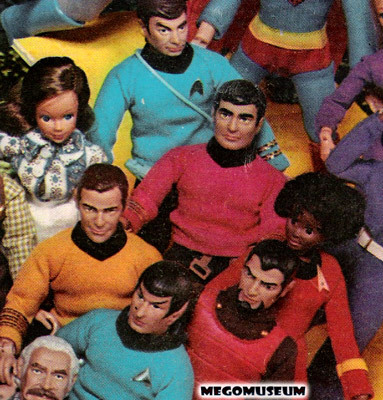 Kirk, Spock, McCoy, and the Klingon were re-released in 1979 for Sears, presumably to provide supplemental product for Star Trek: The Motion Picture, as well as to clear out excess stock in Mego’s warehouse. These reissues differ from the originals in three fundamental respects: first, they were assigned new assortment and item numbers; second (and most famously), in an excessive demonstration of economy, they were released without printing on the package back (earning them the nickname of “Blank-Backs”); and third, the majority of the reissues were given (once the backstock of traditional, two-part “stick-on” foil insignias had been depleted) what appear to be heat-sealed foil insignias, easily differentiated by their white edges. As popular and collectible as the “Star Trek” crew figures are/were, a sizable warehouse discovery of these gems was unearthed in Canada in the mid-1980s, leading to a drop-off in value that the collecting community is only now beginning to recover from, some twenty years later. This reduction in perceived value is both a blessing and a curse, however. While the drop in monetary value has hurt many a speculator and investor in the short-term, the overall affordability and availability of these figures has made them a perennial favorite of collectors–both Star Trek and Mego alike–and a staple of even the most basic Mego collection.